Google's PDF viewer has many practical uses: you can view the PDF files uploaded to Google Docs, view your Gmail attachments (and not just PDF files). 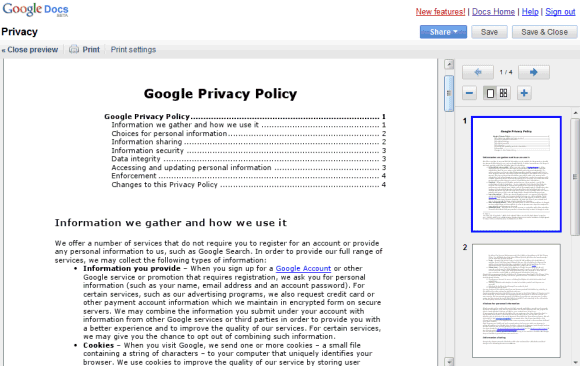 The same viewer is now used to implement "print preview" in Google Docs, a feature available in the File menu. Use "print preview" before printing a document or just to find the number of pages in your document. where DOCUMENT_ID is the ID of the document or presentation (you can obtain it from the docid parameter). Why google is so caring about print ? Print is dead. Save earth. That's a useful feature but still the 512KB limit Google has on each doc is a joke! Remiz: Many report styles require elements such as pagination, table of contents, headers/footers, and multiple columns. Reading from a CRT/LCD screen also strains one's eyes due to the active light source (as opposed to reflected ambient light), screen glare, and relatively low resolution (DPI). The state of the art in electronic paper (so called e-ink) and "@media screen" styles is simply not good enough to replace printing for complex documents. Give it about 4-6 years, IMO. The page count was already in Tools -> Word count. The page counter from "Tools -> Word count" shows inaccurate values. Oooohhh, print preview made it to Google Docs. Am I switching from Microsoft Office any time soon? I think not, I prefer to be productive. Google Docs is ~altogether~ a joke -- bug ridden, full of intentional and unintentional limits, missing crucial features, important features designed by clueless interns and rendered useless, format conversions badly done, etc etc. I wasted months trying to get a client's files up and working usefully before giving up.